It’s October, but we’re still wrangling with Indian Summer over here. Well, we were. The forecast has some storms brewing on the horizon which could be a blessing… or a curse… or both for this week’s shoot. 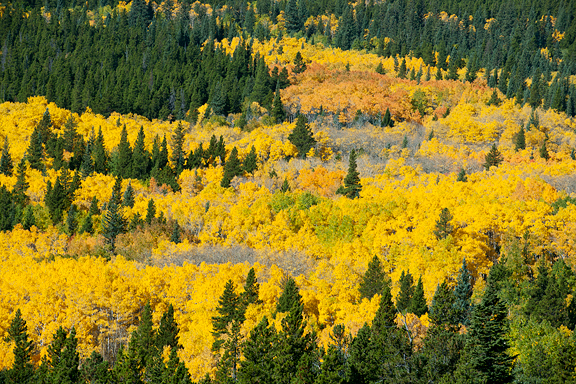 If you are in Colorado, now is a GOOD TIME to get out and capture those fall colors (and say hi if you see me!). All of the action in the kitchen of late has been “cooking to clean out the refrigerator”. I wanted to leave Jeremy with plenty of food while I was gone. Unfortunately, I have a terrible habit of overestimating how much food he’ll need and I pretty much prepared enough food for him to survive a zombie apocalypse. [Side note: I really am convinced that a mountain bike is an excellent way to escape the zombies – if you’re in good shape.] I guess that means I won’t need to cook when I get home. But I must tell you that in addition to the arrival of fall colors, the anticipation of big dump snow days, and my absolute love of Halloween, the cool down in temperatures means I can get roasting, baking, stewing, and pressure cooking again. A few weeks ago I made my own garlic naan and in addition to filling my house with smoke, it also filled my head with visions of fresh naan this winter. I’ve had unyeasted naan and yeasted naan. I like both. I imagine the unyeasted version must be pretty simple (another recipe to try later), but who doesn’t love a challenge, right?! I chose to go with the garlic naan over plain naan because I’m a total sucker for garlic and I always have some on hand. The recipe had me cut the dough into 8 pieces. Given the size of my skillet, I think I’ll make it 10 pieces next time, but it still worked out all right. 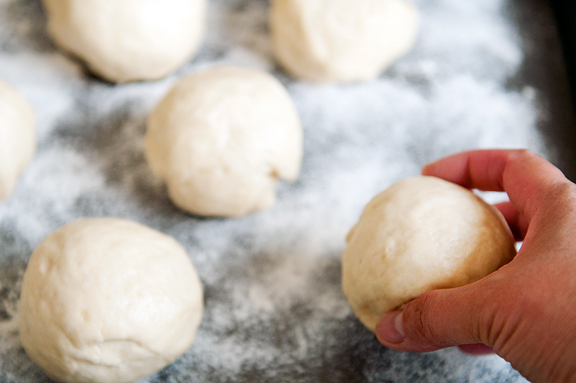 If the dough balls aren’t perfectly round after the second rise, don’t worry. It all gets rolled into two dimensions anyway. There are several methods you can use to cook your naan: tandoor (I don’t have one), broil on a pizza stone (I don’t have a pizza stone), grill (it was raining), or skillet (bingo!). I made a fabulously smokey mess with ghee sputtering, smoking, and garlic burning. Next time, I won’t put the garlic in the pan, I’ll apply it after the naan is cooked. But it’s neat to see how quickly the naan puffs up on the skillet. What I figured out was as the naan came off the skillet, I’d brush it with ghee and sprinkle some minced garlic on it and stack them up. That’s a nice way to get your garlic fix (rather than burning it). I think next time I’ll try the grill method. I hope it will achieve the nice crisp outside while maintaining the beautifully fluffy inside and leave the smoke outside. 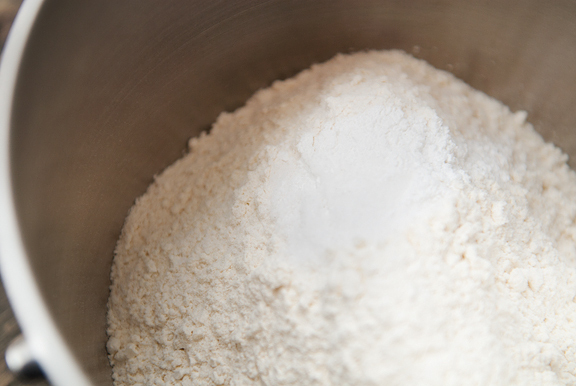 Dough: Place the sugar, yeast, and 1/4 cup warm water (110 to 115 °F) in a small bowl and let sit 5 to 10 minutes until it becomes foamy. 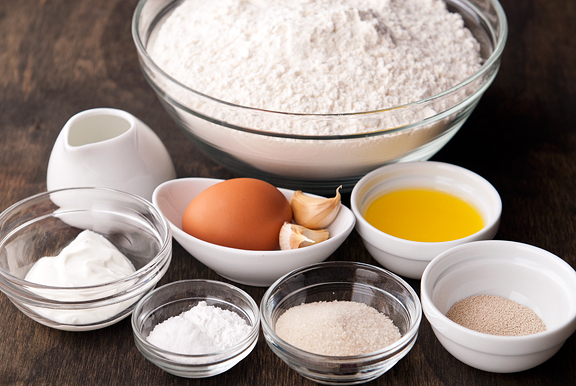 Put the flour, salt, and baking powder in a food processor fitted with a dough blade or a mixer bowl with the dough hook and blend. Pour the yeast mixture, 2 cloves of minced or crushed garlic, milk, yogurt, egg, 2 tablepoons of vegetable oil, and 3/4 cup warm water into the bowl and knead until the dough forms a ball that is smooth and elastic. Estimates are 2-3 minutes in a processor, 5-8 minutes in a stand mixer, and 8-10 minutes by hand. I did a combination of the stand mixer and by hand (I think I had a bit much flour). 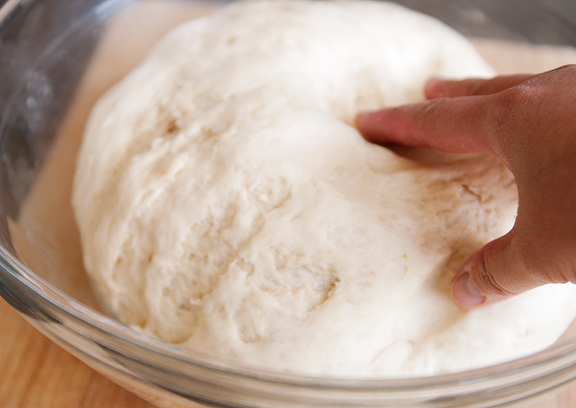 The dough should be soft without being sticky. If it’s sticky, add more flour. Put the dough in a lightly-oiled large bowl. Turn the dough around to coat oil on all sides and then cover the bowl with plastic wrap and let it sit in a warm, draft-free place for 60 to 90 minutes (I put it in the oven). 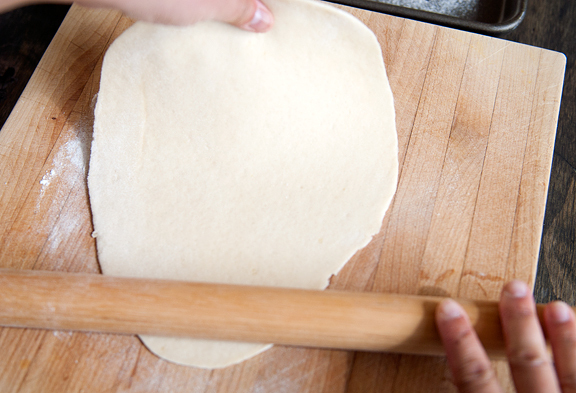 Punch down the dough and cut it into 8 pieces. Roll them into balls and set on a floured baking sheet. Cover with damp kitchen towl and let rise until doubled in size (about 40 to 60 minutes). Cook: Apparently there are many ways to cook your naan. You can heat a tandoor to 450°F, or use your oven broiler, or grill on medium-high heat, or you can use a hot skillet (which is what I did). 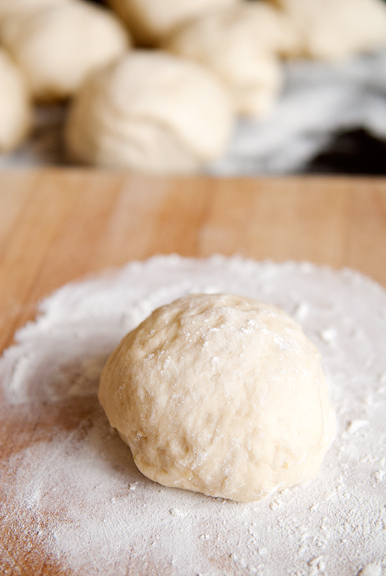 Roll the dough balls out on a floured work surface to a disk about 6 inches in diameter. Stretch one end to make an oblong teardrop shape. If using tandoor: drape one piece of dough over the round cloth pillow called a gadhi. Press the bread onto the hot clay wall. 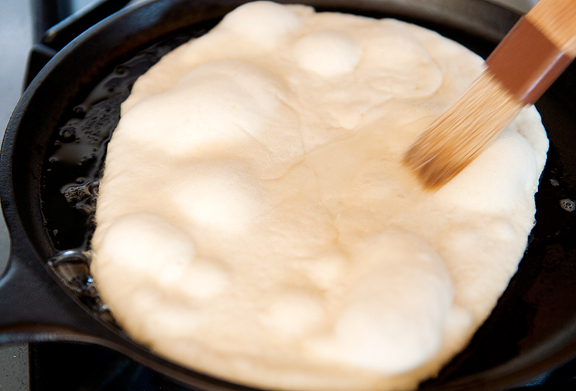 Cook the naan until the top is puffed, blistered and browned, 1 to 2 minutes. Using a skewer, gently pry the bread off the tandoor wall, taking care not to scratch the clay. 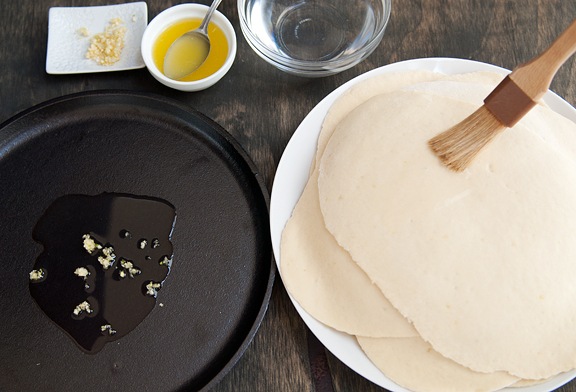 Brush the top of the bread with ghee or melted butter, then place in a cloth-lined basket for serving. Repeat with remaining dough. If using an oven: turn on the broiler. 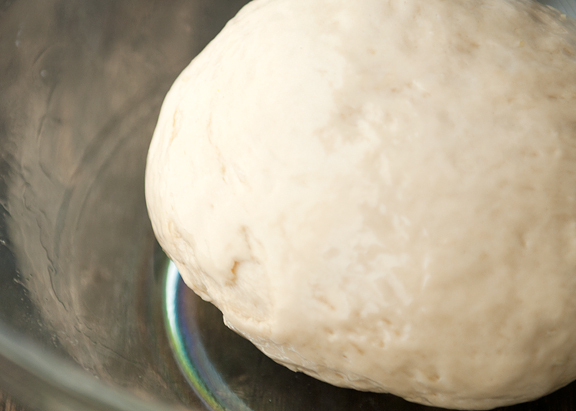 Lay 1 or 2 pieces of dough on the pizza stone. Cook until the bottoms are browned and the tops blister, puff and are lightly toasted, 2 to 4 minutes. Remove from oven, brush tops with ghee or melted butter, and place in a cloth-lined basket for serving. Repeat with remaining dough. If using the grill: brush and oil the grate. Lightly brush top of dough with butter and place butter-side down on grate a few at a time (do not crowd the grate). Grill until the bottoms are browned and the tops start to puff and blister, 1 to 2 minutes. Lightly brush the tops with a little butter. Invert bread, and grill the other side until lightly browned, 1 to 2 minutes. Transfer to a cloth-lined basket, brushing tops of each with any remaining butter. Or if you are using a skillet like I did: Melt a little butter on a hot skillet. Brush the naan with water and place it water-side down. Large bubbles should begin to puff up within a minute. Brush the top of the naan with water and flip it over for another minute or so. 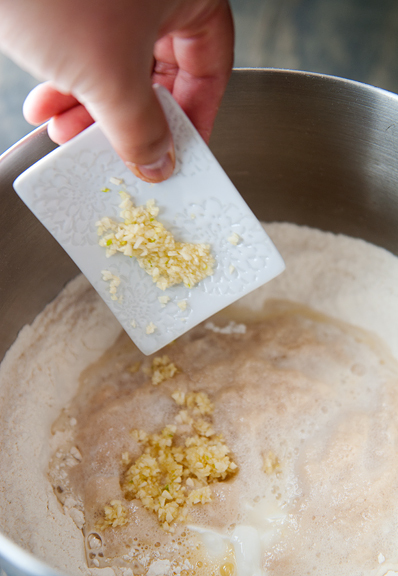 Remove to a basket or plate and brush with melted butter and sprinkle some minced garlic. Repeat until you have 8 naan. Oooh, skillet naan? I could definitely do that. BTW, I notice the new CAPTCHA box. Maybe you’d like to try the Growmap Anti Spam Plugin instead of CAPTCHA? It only requires the user to click a checkbox instead of read and enter letters/numbers. I get zero spam nowadays using GASP and Akismet together. Oh my. I love naan. It still seems kind of intimidating, but I should try it. Good luck on your next shoot! That cereus is a nice surprise, eh? I’ve always meant to make this and your step by step guide has inspired me – have skillet, will make naan. My youngest daughter who is a garlic fiend will be delighted. 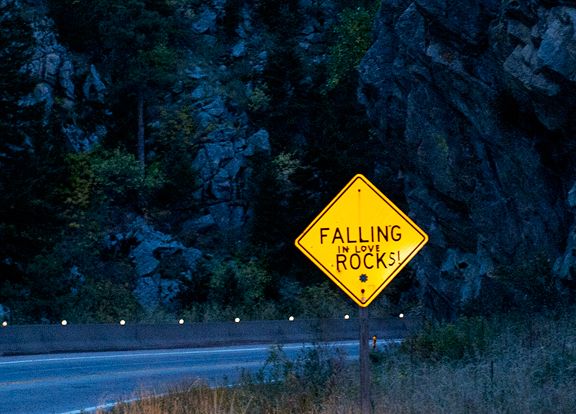 Love the road sign (as well as your fall colour pics). Naan has been on my list to make for quite awhile and I think you just made it very approachable! Looks amazing! I just said to my husband last night that I’m so excited for fall/winter cooking! It’s by far my favorite time of year. Totally making naan this weekend and the more garlic the better! This is a wonderful tutorial, which makes the naan very accessible. I may experiment with some coconut flour naan. Yum, yum, YUM! To try this week for sure! oh my gosh you make this look crazy good. Love this! I bake a fair bit, but have never bothered to figure out naan. That’s about to change. Making naan is on the top of my list of new recipes to tackle. I make Indian food often and the naan I can buy at the grocery is pretty pitiful. 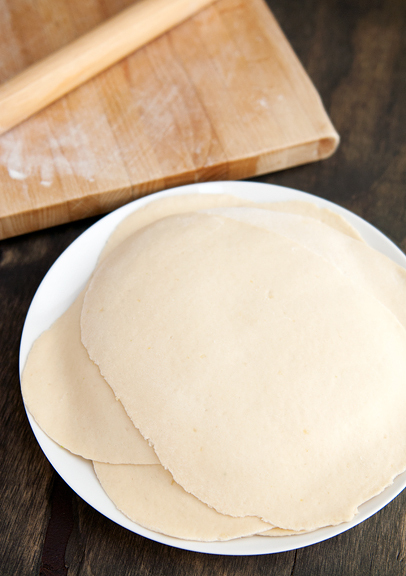 Your naan looks delicious and the recipe not terribly complicated. This looked so good to me this morning that, even though I already had some no-knead dough rising, I mixed up a batch of these. I made them plain, because my favorite way to eat naan is with peanut butter, for breakfast. I cooked them on the grill, and they came out beautifully. Thanks! 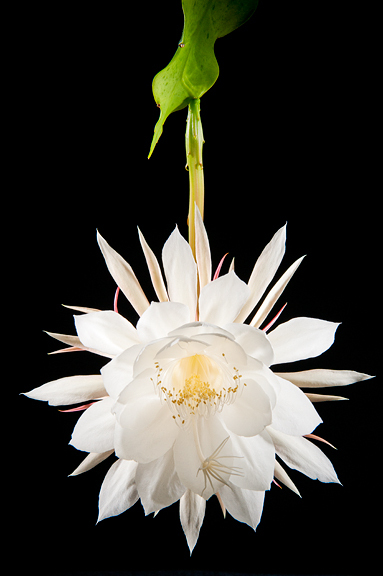 PS Your night blooming Cereus is magnificent ~ I’ve never seen one before… just curious, does it have a fragrance? Well done there! I’m always wary of cooking flour over the hob as the outside always get overcooked before the inside does! But I’m glad yours worked out great! Any idea why it should be made teardrop-shaped? Wow- this is so well-timed! After our trip to London, we were talking about how much we like naan and I’d decided to try making it at home. Here goes! I love naan but never made any myself. This will be a good step -by-step process for me to follow. We always ordered garlic naan in Newab everytime we dine in there. We also tried frozen packaged naan from Trader Joe’s. However, there is no comparison to the fresh made ones. Now I can have my own fresh ones. Thanks. I make naan lots but have never thought to divide the dough before the second rising or to put minced garlic in the dough. Thanks for the tips, will use them next time! Our last curry was butter chicken (which I’ve just posted about), and we grilled our naans. I didn’t think they turned out as good, so will be going back to the skillet. Thank you Jen! Wow this looks incredible. Great pictures, and I am definitely using this recipe! Thanks! Yum. I can’t wait to tell my 13 year old that Naan is a perfect way to survive a Zombie Apocalypse. It is rainy and cold here. I’ve got Kichari stewing. Now I know what to have with it. Thanks! You are such an inspiration! Homemade naan…it looks amazing! Love this bread (and roti) and to be able to whip it up at home would be heaven. These look great! I love, love, love naan but have never made it at home. I’ve always seen recipes that involve baking the naan, but it looks like they turned out just right on the stove. Beautiful! Kitt – yes, it was! I love the fragrance. 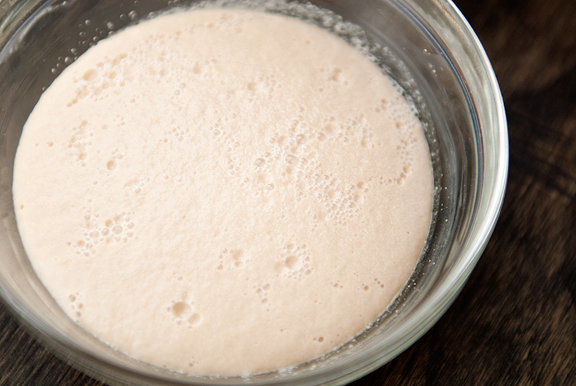 The Hungry Traveler – yeast is your friend. Once you try using it, you’ll be a happy camper. Handcrafted with Altitude – ooh, that sounds great. Spotted Dog Farm – Same here, it was surprisingly straightforward! Tracy – oooh, great to know! I wanna try the grill next time. Margie – yeah, just be patient. It will eventually cool down. Mari – green onion? I gotta do that! And yes, it does have a LOVELY delicate fragrance. So sad that it only blooms for a few hours. Every time I get a chance to visit your web site, I’m not only amazed by your recipes, cooking instructions, notes, etc. but your nature photos have always put me under a spell – they make me want to be outdoor and “feel/ experience” what you saw! They are truly incredible photos! I made this last night along with your Tikka Masala. My daughter has declared this her new favorite bread. I made 10 balls instead of 8, but we only used 6. I have the rest, along with the VERY SMALL portion of leftover TM, in the fridge. I had planned to heat the TM up and make the remaining naan for my friend who is coming over soon, but my daughter let me know that that is grounds for de-doption. Your step by step photos really made it easy to be brave and try something brand new. I also love that you gave the directions for using a stand mixer to make the dough. I love my KA and I am always on the lookout for recipes that let me use it. stumbled across your blog on naan – I always make it in the oven under the broiler use to do it on a baking sheet til I got a pizza stone both ways work well. Happy cooking! Your pictures and recipes look so good. Is there a possible way I can print out only the recipes? U make it look easy… One day I will try it… Thank you! 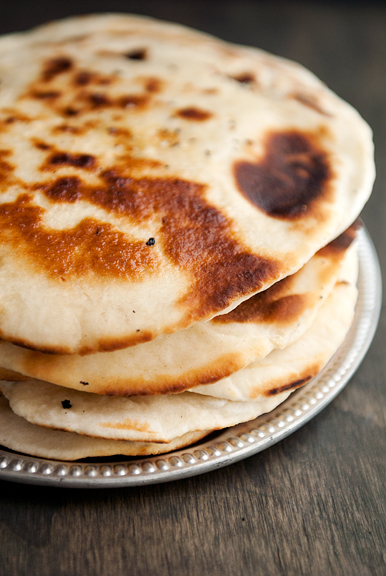 Thanks for sharing such a wonderful version of Naan, Love garlic….I made the naans for lunch today. they came out exceptionally well, even for first try.